Adding your logo and brand to vehicles is a great way to get attention on-the-go. The average vehicle wrap reaches up to 70,000 impressions per day – and all you’ve paid for is the sticker. The rest of the marketing is free. However, that also means it’s really important to make sure your design leaves the right kind of lasting impression. 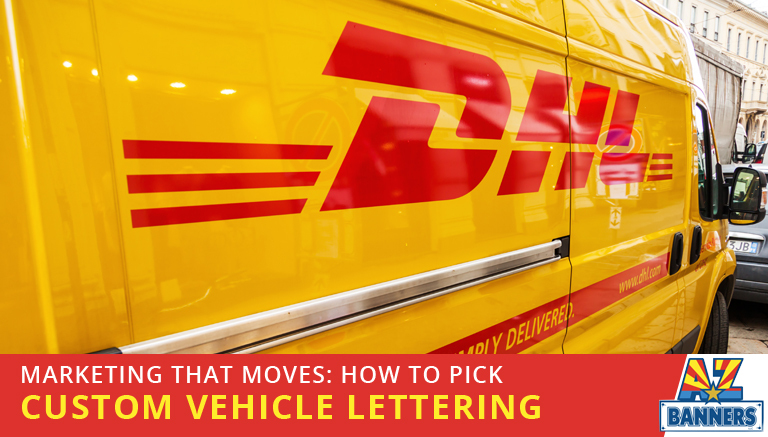 From custom vehicle lettering sizes to the colors you choose, read on to learn how to design an effective vehicle wrap that people will remember for the best reasons. The writing you choose to put on your vehicle says a lot about your business and brand – here’s how to get it right. Curly script fonts can’t be seen when a van is moving above 10 miles per hour. Strip back your desire for cursive font types and focus on what can be seen easily while in motion. Block lettering and sans serif fonts are easy to read from a distance. In addition, a sans serif font is more suitable for those with reading impairments, such as dyslexia. Using one will ensure you’re not alienating potential customers with your marketing strategy. Now isn’t the time to be shy. Go big, go bold, and splash your vehicle with your branding. The larger your sticker size, the bigger your lettering can be. You could choose several smaller panel stickers to make up an overall design, or go all-out with a full vehicle wrap. Your marketing needs to make an impact, so make sure your brand is easily identifiable from every angle. If you’re tight on space or want to use your vehicle personally as well as for business, a car magnet is a perfect solution. It’ll be large enough to be seen when you mean business, but easily removed when it comes to the weekend. Choose easy-to-read and contrasting colors to make sure your lettering stands out. The classic black-on-white never fails, but you can always get creative and pick a combination of high-contrast colors from your brand palette. Aim for dark-on-light or light-on-dark contrasting colors to really make your message stand out from a distance. Avoid using similar colors, such as light green text on a dark green background, as this is confusing to read in a short space of time. Don’t make it on a list of vehicle wrap fails. Think about where your stickers will be placed on your van or car, and how this placement will be affected by the vehicle features. For example, if your van has sliding doors, consider what text will show when the door is open as well as closed. Think about how your vehicle signage will be viewed when you take into account features such as door handles. The most text you need on your vehicle is your brand name, website and phone number, and one marketing strapline if you have one. Try not to overload your vehicle branding with too many different messages. Your aim is to build brand awareness and give people an easy way to contact you for more information about your business. Some vehicle wraps use photos or intricate and detailed backgrounds, but it’s rare that this works well. You need to make sure your message is simple, easy to read, and makes an impact in a few seconds. Clear text, an easy-to-read company logo, simple graphics, and colors that make an impact are all you need to make sure your brand is remembered. When you’re ready to put together your ideas, custom vehicle lettering, logo, and marketing message in a vehicle decal, it’s time to pull it all together in a unique design. If you need help working out how your design will fit your fleet vehicles, that’s where our expert team can help. We’ll use templates based on your vehicle model to make sure your design works with the bumps and curves of your car or van. Contact us today to find out more about custom vehicle graphics to get your out-of-home marketing strategy on the road. Are you looking for quality branded vehicle graphics to maximize your visibility? AZ Banners offers affordable, eye-catching company logo stickers, decals, and vinyl lettering for cars to help you boost your brand. Get started today by requesting a quote online or calling 480-458-8128!